Masbate City, [03.24.18] – Police investigators are eyeing robbery angle as one of the possible motive in the couple’s cold-blooded murder of a couple in Barangay Dayhagan, Aroroy, Masbate. Police Chief Inspector Edgar F. Valencia, Chief of Police of Aroroy Municipal Police Station told RODEOtabloid that they are still conducting an in-depth investigating on the case to identify the identities of the murderers of Punong Barangay Shiela Mataverde-Drio, 47 years old and her husband Regalado Mosico Drio, 48 years old. According to PCI Valencia the gruesome murder occurred on Thursday evening [March 22] at around 9:30 inside the residence of the victims in Barangay [village] Dayhagan, but the report reached the police on Friday morning. Five unidentified armed men barged inside the house of the victims and disguised to conduct business transaction with the victims, while inside the residence the suspects started threatening the occupants and simultaneously rummaged the room and forcibly took the cash amounting to PhP200.000.00. When the money was found the suspects shot their victims in cold blood who died instantaneously and the robbers left the crime scene without a trace. The victims sustained multiple gunshot wounds and died on the spot. 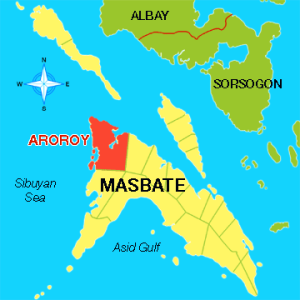 According to the Aroroy police, Barangay Dayhagan is 16.4 kilometers away from downtown Aroroy and is a rebel infested area of the municipality.